In his Valentine’s Day Message, Charlie Vanden Heuvel indicated “There may be emergencies demanding entrance, but they are rare! Be Patient!!! He suggested unless temperatures are above 60° for 3 days we might do more harm than good opening colonies. So what “should be going on inside our colonies right now? Queens have started laying eggs, especially those less than a year old. Our generally warmer winter weather in January and this month, has enabled the workers of colonies with larger populations to expand the cluster size, opening up more cells for queen egg laying than might be considered “normal”. Most colony clusters have moved upward and are now below the colony cover. They will have to expand sideway and downward to accommodate the growing brood cells. 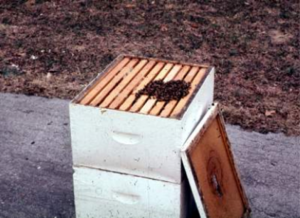 Photo shows top and inner covers removed to show “typical” position of a mid-February colony cluster of a 2 box (standard 10 frame) Langstroth hive. February is “pivotal” for colony development; the bees are often living close to the “edge”. There is an adult age imbalance, more older than younger bees, because the Fat bees reared in the fall are now senior citizens. As the warming weather permits flight, older bees use body resources quickly, hastening their death. Fresh pollen to the February hive is highly stimulatory and important to rear critical replacements for the aging adults. But such expansion, along with the aging bees and clusters in the top brood box (of whatever type of hive you are using to house your bees), mean less bee flexibility to quickly adjust to changing weather. Colonies less frugal with adult and stored food resources lead to the possibility of failure to survive in the coming 2 months. Underpopulated colonies, trying to keep expanded brood nests warm, can be lost in a cold, wet weather spell. As Charlie points out, It is too cool and too risky to attempt colony manipulations this early. Tilt (heft from back) colonies to get an estimate of their food resources. Colonies deemed short on stores can be fed a sugar cake or dry sugar (fondant/crystallized/drivert or mixture of fondant with crystallized). Feed right on top of hive, on piece of newspaper, or within your moisture chamber (if you are using one). Do not supplementally feed sugar syrup yet, it is too early. 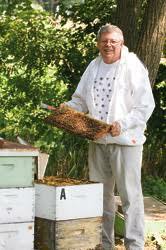 Some beekeepers like to also feed a pollen patty to their colonies. For the PNW, I have been conducting a winter Loss/Survivorship Survey. One additional year of data will enable a better analysis of trends and correlations of losses to weather variation. The PNW HONEY BEE SURVEY included over 350 respondents last year. Won’t you join us this year and share your overwintering loss/successes and answer a few questions about your overwintering/mite management? It accommodates all hive types and all management preferences. It is simple to fill out and takes only a few minutes. It is electronic – access at address pnwhoneybeesurvey.com/survey The website is open for your survey responses in April. Due to the warmer weather many have been looking at their bee colonies already this spring. If you want to make notes see http://pnwhoneybeesurvey.com/notesheet/ – it will make filling out the April survey easier and faster.